Offer your edentulous patient the ultimate in esthetics with Dental Masters’ IvoBase injected signature denture. 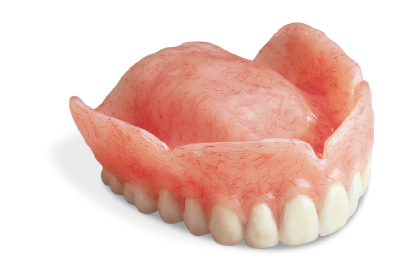 The signature denture is fabricated using Product Training Corporation’s cutting-edge set & wax-up technique, producing exceptional characteristics with the finest attention to detail. Featuring next generation Phonares II teeth, our Signature Denture boasts unmatched esthetics and intricate, lifelike detailing. Dental Masters’ premium denture is produced using state-of-the-art IvoBase injection molding for the most consistent results and precise fit, all at an approachable price. This denture option, which comes with highly-esthetic Enigmalife + teeth, resists plaque and bacteria buildup and has unmatched accuracy of fit. Designed and fabricated with Lucitone’s 199® hand-packed acrylic and lifelike Artic® teeth, Dental Masters’ Value Denture is the ideal restoration for patients seeking everyday esthetics at an economical price. For patients looking for a natural smile in combination with fit, form, and function, the Value Denture will not disappoint.